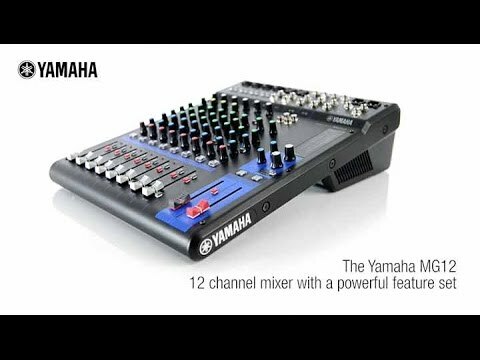 Featuring everything you could need for a gig the Yamaha MG12XU has first rate build quality, compression, effects and studio sound as stand.. Featuring everything you could need for a gig the Yamaha MG12XU has first rate build quality, compression, effects and studio sound as standard. The latest generation of mixers that set the bar for portable PA and small to medium installations. Per Channel Compression Nothing can save your skin at a gig quite like a bit of compression on vocals or other dynamic sources. SPX FX The 6 presets on board give you all the effects you need to create a sense of space in your mix. This third generation of the acclaimed MG Series compact mixing consoles focus on delivering high quality sound, at a modest price point. With the same mic preamps as Yamaha’s high-end professional mixers, MG provides serious sound with the reliability and performance this series is renowned for. With an intuitive, easy to use interface, the MG Series boasts an extensive 10-strong line-up with models ranging from six to twenty channels. ‘XU’ models provide both USB audio interfacing and SPX FX processing making it easier than ever to plug-in, play, record and then listen to your creations.